NASA's Mars rover Curiosity discovered the small, round stones near its landing site in Gale Crater on the Red Planet in 2013. Researchers previously determined that these stones resemble those found in rivers on Earth, which become round as they slide, roll and hop down riverbeds and scrape other rocks. "We believe liquid water is a principal ingredient for life," study co-author Douglas Jerolmack, a geophysicist at the University of Pennsylvania in Philadelphia, told Space.com. "Knowing whether pebbles in a river moved 1 kilometer or 100 kilometers [0.6 miles or 62 miles] could tell us how stable water was on the surface of ancient Mars." The researchers developed a mathematical model to deduce how blocky rocks become rounder and smoother as bits of them chip off due to erosion. Then, the investigators analyzed the shape of the Martian pebbles to estimate the amount of mass each lost due to erosion. "An object's shape can itself tell you a lot," study co-author Gábor Domokos, an applied mathematician at the Budapest University of Technology and Economics, said in a statement today (Oct. 13). "If you go to the beach, natural history is written underneath your feet. We started to understand that there is a code that you can read to begin to understand that history." To test their model, the researchers rolled limestone fragments in a drum and recorded the changes in their shape and mass. They found that the pattern of changes in the rocks closely followed their models. Next, the researchers went to a mountain river in Puerto Rico, to analyze the rocks there. "We started at the headwaters, where chunks of angular rock are breaking off from the walls of the stream, and went downstream," Jerolmack said in the same statement. "Every few hundred meters, we would pull thousands of rocks out and take images of their silhouette and record their weight." The scientists again found that the trend of changes in these rocks closely followed their model. The researchers also analyzed rocks in an alluvial fan — the fan-shaped deposit of sediment that builds up as a stream flows — at the mouth of a canyon in New Mexico. This area closely mirrors the location where the round pebbles were found on Mars. This work suggested that the shape of the rocks could help scientists estimate how far these stones traveled. "This is the first attempt to deduce the history of a particle from its shape alone," Domokos told Space.com. 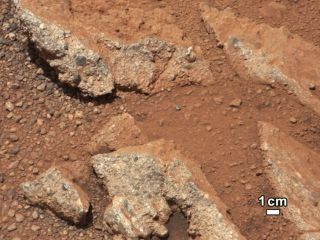 Using publicly available images of the rounded pebbles on Mars from the Curiosity rover mission, the scientists calculated that those rocks had lost about 20 percent of their volume. When they factored in the reduced Martian gravity, which is only about 40 percent of Earth's, they estimated that the pebbles had traveled about 30 miles (50 km) from their source, perhaps from the northern rim of Gale Crater. This research could also help scientists analyze river-borne particles on other planets and moons, such as Saturn's largest satellite, Titan. "There are pebbles there made of frozen water imaged by the Huygens probe at the mouth of what looks like a river channel," Jerolmack said. The new method the researchers developed could help analyze not only the history of pebbles in liquids, "but also sand grains in less viscous fluids like air," Jerolmack said. "Our findings can be utilized to look at windblown sediments on Mars, Earth and other planetary bodies where windblown sediments are found." Despite the extraterrestrial applications, a better understanding of the history of particles "is probably most useful on Earth," Jerolmack said. "Gold and iron ores are often found in rivers, and gas and oil in river deposits, and people will want to know how far pebbles associated with these resources have traveled, to identify their sources." The scientists detailed their findings online today in the journal Nature Communications.